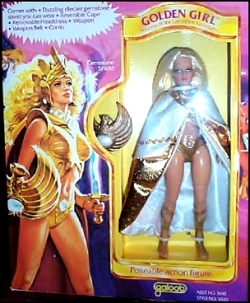 1985 would see the release of a most unique line of figures: GOLDEN GIRL AND THE GUARDIANS OF THE GEMSTONES, made by the GALOOB toy company. The line was aimed at young girls and featured 9 females and, in an ironic twist, only 2 token men. The series was set in a world before history on EARTH when myth and magic still existed. GOLDEN GIRL AND HER GUARDIANS, named after precious stones, protected the powerful GEMSTONE from getting into the clutches of the evil DRAGON QUEEN, a white-skinned, pink-haired lady from STORM ISLE, who would then use it to take over the good islands of ARGONIA. The Golden Girl Guardians were; RUBEE - the archer , JADE - who had second sight, ONYX - the line's only black member and the best swordswoman, and SAPHIRE - who could communicate with any creature in the sky and sea. Also joining the girls was good PRINCE KROMA, who looks suspiciously like He-Man. They were obviously trying to make the line attractive to boys too. The villains in the line were; the DRAGON QUEEN, VULTURA - sorceress who wielded a vulture's claw as a weapon, WILD ONE - a dangerous viking with cool tattoos and painful looking boots, MOTH LADY - a winged witch and OGRA - a male barbarian. There were 2 horses as well; OLYMPIA for Golden Girl and SHADOW for DRAGON QUEEN. Both had light up eyes and horns. A playset called THE PALACE OF THE GEMS was also issued. Since the was intended for girls, there were also 3 strange fashion sets released; FORREST FANTASY, FESTIVE SPIRIT and EVENING ENCHANTMENT. Each figure, including the guys, had; rooted-hair, a cape, weapon, weapon belt or harness for the guys, helmet and a diecast metal shield that is often too heavy for the figures to hold. The shields were intended for girls to wear as a broach when not not in battle. The line was stunning and truly original but it did not do well and was canceled after 1 year. It suffered because it was really kind of confusing as to who it was made for. It was supposed to be a girl's line but it was too masculine, because of all of the weaponry and scantly clad outfits the GUARDIANS wore. It was too feminine for boys because of the outfits and rooted hair. It was really a missing link , made for both sexes at a time when there wasn't really anything like it. It did pre-date SHE-RA, which did better because it was a HE-MAN spin off for girls and, it had a cartoon. It was obvious that they had high hopes for this line because of the supporting merchandise like; books, a COLORFORMS set, a BEN COOPER costume for halloween, drinking glasses, a game and a watch, to name a few. A cartoon done right would've knocked SHE-RA out of the picture, in my opinion. Finding these toys takes a little doing since they only were released for one year. A lot of male collectors love this line more then SHE-RA, which was too cutesy and campy. The villains are easier to find then the heroines but, the 2 men are usually the hardest to get complete, especially PRINCE KROMA. If you find them on auction or sales sites, they usually won't cost more the 10.00 -15.00 dollars complete. The popularity and acceptance that today's kids and collectors have for female figures has changed since 1985 and in a way, GOLDEN GIRL was the figure line that did that. It is truly one of the most unique and incredible lines a toy company ever made. With the popularity that toys from the 80's are enjoying now, who knows? Maybe it is a good time to take another trip to ARGONIA and watch GOLDEN GIRL AND HER GUARDIANS make the peaceful lands a safe place from the DRAGON QUEEN once again. *A Golden Girl fan writes: "Hi, I just read an excerpt on your site about the toy series, Golden Girl and the Guardians of the Gemstones. I wanted to add that there was a Golden Girl boardgame (I know because I had it), and there was, indeed, a cartoon based on the figures. I have seen the cartoon, and I guess it didn't do much better than the toys because it wasn't a long-running show. Anyway, I just wanted to add that, and hope that you correct the part on your website that says that there was no cartoon, because I strongly remember seeing it on TV. Thank you!"